Kambili comes from a devout Catholic family. As the story starts, her older brother Jaja has caused a family row by not attending communion. Threat is heavy in the air from this opening incident, both in the reaction of their father and in Kambili’s silent pleas to her brother to ‘seal his mouth’. The family are wealthy, and much admired in their community for the huge amounts of money that ‘Papa’ gives away. He is a pious and devout man, but he is also controlling and violent towards both his wife and his children. Kambili is desperate to please her father. She longs for his approval, and to do things that will win her his love. Coming second in her class at school is not good enough – she must be first. Punishment is severe – for ‘walking into sin’ (sleeping in the same house as her grandfather, who is not a Catholic but worships old gods) Kambili’s feet are burnt with boiling water. And then everything changes when Kambili and her brother go to stay with her father’s sister, Aunt Ifeoma. Although still a Catholic, Aunt Ifeoma and her three children practise a much more relaxed form of the faith, and theirs is a house of laughter and freedom to say what you are thinking. With this new perspective, Jaja in particular starts to rebel against the restrictive ways of his home, while Kambili tries to reconcile her still overwhelming desire to prove worthy of her father’s love with her growing realisation that life could be different. This is a book about clashes – old faiths with new, old regimes with new, different styles of family life, love and hatred. 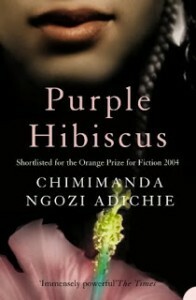 It is the author’s first book, and was shortlisted for the Orange Prize for Fiction. It is beautifully written, with Kambili a convincing voice. This book was enjoyed by everyone at the meeting, with us all agreeing this was a superb first novel from this author. The book for next month is The Bell Jar by Sylvia Plath. We will meet on Thursday 16th November.